Specialized helmet replacement scheme: how does it actually work? This topic has 19 replies, 11 voices, and was last updated 10 years ago by FuzzyWuzzy. Well, following a bit of a nasty crash on Wednesday night, my Spesh S1 helmet has a proper crack, and a piece missing out of it. 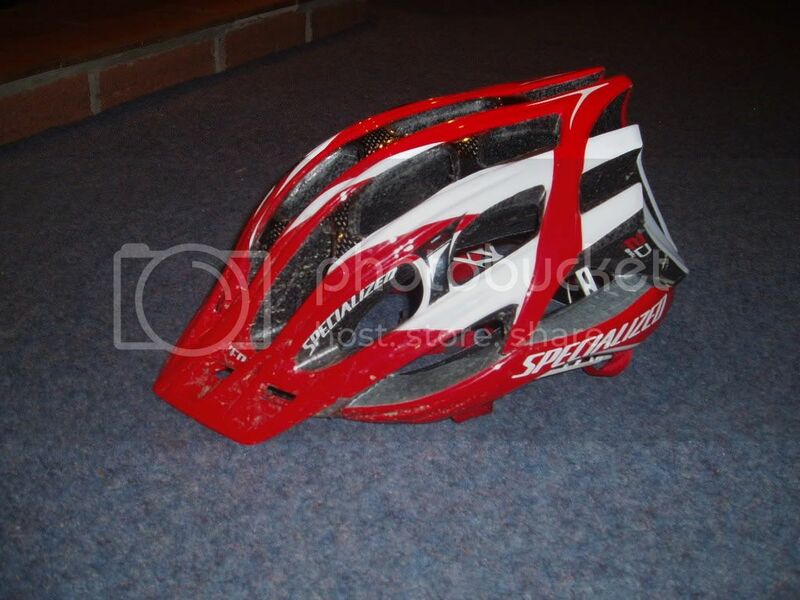 I did have concussion, but fortunately the helmet has done it’s job, of saving me from far more serious injury, thank God. So what’s the deal with the replacement/discount scheme? Anyone had experience of how it actually works? The helmet was bought in 2003, when I worked at Cycle Surgery. I have no receipt, as I bought it through the Staff Discount scheme they had. Cost me £50, I think. Was a £100 helmet at the time! I may be able to provide proof of purchase through CS. What do I need, to get a replacement/discount, if indeed this is still possible, after all this time? I can’t remember what the deal was, when I bought it. I will be buying a replacement, but it would be nice to get a bit of money off, in these austere times. And what’s the current equivalent of an S1? Small, light and low-profile. Just tried this number, seems to be outdated, Epsom Motor Company or something. The nice lady there gave me the following to try, which woked a treat. Ah, nice one,thanks. I’ll try the second number, when Tiscali fix my bloody ‘phone line. Odd, that my internets aren’t affected. That 2D looks nice. Think I’ll toddle down to a bike shop later, to try one on for size. Oooops sorry about that! Cheers for finding the right one! Glad your bonce is OK RB. Well, I’m not sure about that, but it appears to be intact, at least. What state the contents are in, is anyone’s guess. Best to preserve the pickled remains a bit longer, praps. Yeah from what I was told you don’t need proof of purchase and I think you can also request a different colour for the replacement (no clue if diff size is allowed though). Dented my 2D a few weeks back but needed a replacement a few days later so ended up having to buy a new one, haven’t decided yet if I want to spend another £50 on a spare (already have two Giro’s for that :p ). The 2D is a far better helmet, you’ve done yourself a favour by smashing up your S1! It’s all about the white IMO. The 2D looks good. White would certainly be a good idea, in terms of night-time visibility. Hmm..
Just spoke to Spesh UK (really nice sounding Aussie/Kiwi lass), and all I have to do is send the helmet back to them, and a cheque for £50, and I’ll get a brand new S-works 2D helmet! Sweet! Plus, I may be able to have mine sent back, so’s I can give it to my Yute Worker mate, to show kids on his cycle scheme thing why you should wear a helmet! I have a lot to thank that helmet for. Quite possible, it saved me life. Certainly from far more serious injury. If it can possible be used to persuade others why they should wear a helmet, then that would be fantastic. It’s probably caused you severe spinal injuries due to unmeasurable rotational forces. It possibly took out an orphanage too. In a spookily similar case; a mate of mine was knocked off his bike. A few bruises, nowt much. Decided he wanted some compo, so he jumped on his bike wheel or something, to damage it and therefore have something to claim for, and ended up with the same result! The bike was fine. Just get the white one. Nah; the red is too lary. It’s a choice of white, black or grey, I reckon. The topic ‘Specialized helmet replacement scheme: how does it actually work?’ is closed to new replies.